Kitchen Contours was established in 1984 by David MacKay and from its inception has been a proudly Wanganui based business. As the business began to grow - so too has the number of staff. From a one man business - Kitchen Contours now employs over 15 staff members, some having worked for Kitchen Contours from anywhere between 13-22 years. 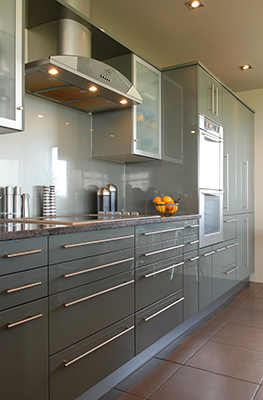 In 1993 Kitchen Contours began showcasing its kitchens in Wellington. In that 15year period Kitchen Contours has come to be one of Wellington’s major kitchen producers – with most of the 300 kitchens that we produce each year destined for the Wellington market. We have also been involved in shipping fully assembled kitchens to Japan. David travels to Europe and Australia on a regular basis to the largest kitchen and machinery expos and shows in the world. These shows enable Kitchen Contours to keep up with the technology required in today's very competitive market and to also get fresh ideas in kitchen styles and materials. Kitchen Contours always endeavours to do a quality job complete with a competitive price to ensure that our client receives a kitchen they can admire for many years to come.